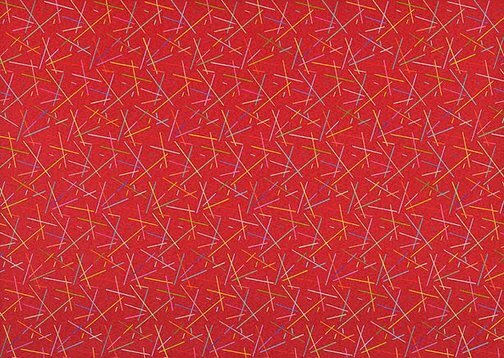 Following a strong, figurative training at the Royal Melbourne Institute of Technology, Lesley Dumbrell began teaching there in 1966, and met the American colour-field painter, James Doolin. Through Doolin she was introduced to the new medium of acrylic paint. 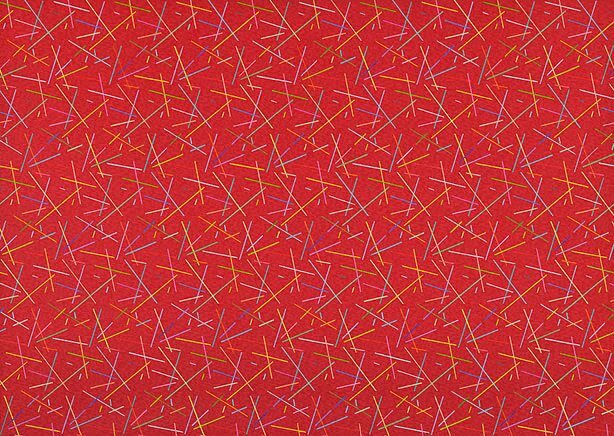 During this period, Dumbrell also began her investigations into the work of Bridget Riley and Raphael de Soto, key members of the international Op Art movement of the 1960s. In 'Spangle', Dumbrell incorporates the retinal effects of Op Art – the dazzle and afterimages produced by geometric pattern and contrasting colour. The surface is criss-crossed with lines of varying but standard lengths, laid out with mathematical precision to create difficult but decipherable rhythms and a near-moiré dazzle from the intersection of the angled grids of dots and dashes – a chromatic ‘Morse code’. Signed and dated centre stretcher member, green marker "...1977/ L. DUMBRELL..." and verso, red oil "L. Dumbrell. 1977/...". Michael Desmond, Contemporary: Art Gallery of New South Wales Contemporary Collection , 'Abstraction', pg.16-59, Sydney, 2006, 30, 31 (colour illus. ).